After interviewing numerous islanders about their experiences evacuating or waiting out Hurricane Florence on the island, one thing is clear. Everyone hates the Weather Channel. 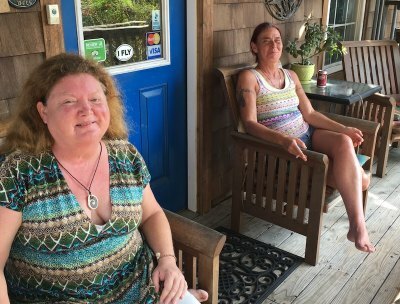 Ocracoke residents uniformly expressed dislike with what they feel is the hype or over-dramatization of weather events on a network with 24 hours to fill and an audience to keep entertained. Islanders seem to depend more on the official forecasts from agencies such as the National Hurricane Center which is part of the National Oceanic and Atmospheric Administration (NOAA). Hurricane Florence had the potential to cause great damage to our small island and while we count ourselves fortunate that a last minute turn saved us from disaster, we recognize the devastation and heartbreak that those in the affected areas are experiencing. I was particularly curious as to exactly what persuaded those who did not evacuate to stay and conversely, what prompted the evacuees to leave, and what items of value did they take when they left? Almost without exception, those who stayed put cited the Wednesday morning report showing the storm turning to the south. As a fairly new permanent resident I was quite terrified at the prospect of being in my home while it was being slammed by 130 mph winds. On Wednesday morning, safe at the home of my daughter and her husband in High Point, NC, I saw that the storm had turned and slowed down. I don’t regret leaving though because it was an extra week to see old friends and spend time with family. 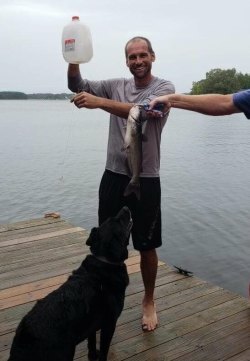 While my husband evacuated with his boat and dog, I took the cats, our children’s baby books, some photos and photo albums, and irreplaceable artwork created by our daughter. David Tweedie was making use of the time following the storm to catch up on some home projects before visitors returned and life got busier. David, who has lived on the island for 25 years, and his father-in-law, Philip Howard, who has lived here twice as long, both stayed put. David says that they were preparing to leave but relied on the Wednesday morning report showing that the storm had turned south and the NOAA reports that showed only a probability of 1 to 3 foot flooding so they decided to stay. Philip emphasized that neither he and David, nor anyone who chooses to stay during a major weather event, does so lightly. They are fully cognizant of the dangers of the storm and it is a judgement call. David did comment that they tend to evacuate more often now that they have a child and they usually try and make evacuations into vacations. (Hence the term “evacucation.”) His wife, Amy Howard, and son, Lachlan, did head to Asheville to take refuge with her brother and his family. Amy chose to take with her a hair barrette that she got as a gift for her 17th birthday in Germany. “Why I chose that instead of 100 other things I don’t really know, but it made me feel better knowing I had it with me,” she said. Also with her was a carefully wrapped package of Philip’s great-grandfather’s handwritten shipwreck log. Amy Howard took this barrette with her. It was a gift for her 17th birthday. At Books to Be Red I caught up with Leslie Lanier, Caroline Novak, and Allison O’Neal. Owner Leslie and her husband, Beaver Tillett, went to a hotel in Greenville, NC. Beaver is an Ocracoke native and Leslie has lived here for more than 30 years. She said that they evaluate each hurricane by the facts and potential impact to the island but they left more often when their children were young. 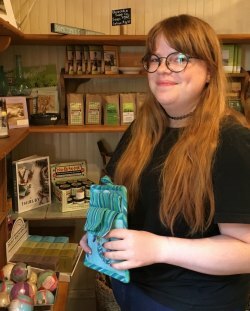 Prior to the storm, Leslie and her staff were so busy readying the shop to be safe that she didn’t really think to take any personal mementoes. Caroline Novak puts Books to Be Red back in order after the evacuation. Caroline, a senior at Ocracoke School, and her family went to her grandparents' house in Thomasville, NC. “We had a total of 12 people, 3 dogs, two cats, and one rat,” she said. In addition to the Bryant/Novak family, Caroline’s older sister Amber and her family, newly moved to Wilmington, rode the storm out in the Piedmont. Caroline said that she prepped her room at home but brought along her X-box, computer, and schoolwork. Her mother, Mary Bryant, brought her grandmother’s charm bracelet while her dad, Richard, brought his class ring from Duke University. The expense of leaving your home for an extended time was mentioned by many residents including local business owner Sarah Fiore. She and her husband, Brad Yeatman, stayed, partly to protect their home and business and partly because they have four cats and two chickens. “It’s a hard decision,” Sarah said. “We had people trying to get us to leave and sending updates. It’s expensive to leave.” However, she said, if the storm had been stronger and had not turned they were considering it. They had a generator to help with the one power outage and plenty of plywood with which to board up their windows so they were comfortable. Loop Road resident Finley Austin and her labrador retriever, Atticus, left the island for a friend’s house in Richmond, VA. Finley had prepped her house for the storm, had plenty of provisions, and had decided to stay. She said that so many people were messaging her about the coming storm that she began telling them that she was leaving just so they would leave her alone. When she saw the 5:00 AM update on Wednesday, September 12th showing that the storm had turned, she felt good about her decision. Then she received a text from her friend in Richmond saying “You’d better be on that ferry!” so she decided to go. She took her four favorite paintings, a box of family photos, and insurance papers, then she and Atticus hit the road. Finley said that Atticus enjoyed the evacuation. “He loves car trips and he is happy as long as he is with me,” she said. She expressed gratitude for neighbor Susan O’Neal, who checked on her property while she was gone. I ran into island residents Bill Jones and Liz Hotchkiss at the post office. Bill and his wife, Lida, left the island and went to Kitty Hawk, always projected to be out of the path of the hurricane. They decided to leave when it looked like the storm would move a little further north and took passports, important papers, and old family photos. Liz went to her townhouse in Washington, NC, but because her family was worried she traveled on to Raleigh to stay with other relatives. She took her computer hard drive that contains all of her family photos, important papers, medicine, and clothing. Bill and Leslie Monticone have been homeowners since the early 70’s and full-time residents for more than 20 years. Leslie said that though they missed one hurricane due to a planned vacation, they have never left for one. Their house is in a sheltered place and high enough to avoid flood waters. They have trimmed trees that might cause problems in a storm and their house is outfitted with hurricane shutters. “We were packed and ready to go in case the storm didn’t turn,” said Leslie, though they preferred to stay. They said that if they are gone, a small problem, such as a broken window, could become a large problem by the time they would be able to return to the island, a sentiment echoed by many other residents. They passed the next few days in the dark with no power while the storm raged and rain fell. They listened to a battery-powered radio and ate sandwiches by lantern light. She also made use of her car to charge their phones but it seemed that every time she went down the four flights of stairs to charge her phone there would be a tornado warning and she would scurry back upstairs! Robin says that as difficult as this has been they are both fine and know that they are so fortunate considering all of the trauma that other people are experiencing. She found it difficult to be away from her husband at a time like this but Chad felt that it was important for him to stay and look after the house. He moved many items from the house to the upstairs area, including the supplies that Robin uses for her jewelry-making business (she took her inventory with her to Wilmington), but he says that had the forecast not changed, he was thinking of leaving the island, too. “Wednesday morning was a big relief,” he said, speaking of the change in the storm’s predicted path. Oscar’s came through unscathed except for the loss of one tree. 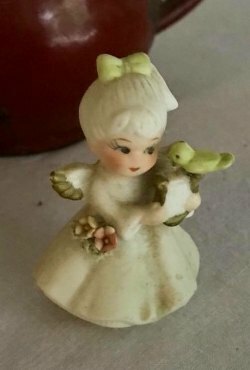 Melinda Sutton evacuated with this ceramic angel. Ashley Harrell of Gaffer’s Restaurant took time out while preparing Meals on Wheels lunches to recount their evacuation adventures. She and her husband, Red, rented a house on Lake Gaston, on the NC/VA border to house her family and all of their employees. She said that not everyone has the means to evacuate and she feels a responsibility to her staff. 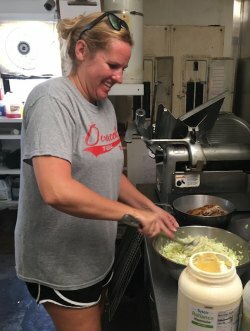 A few employees, primarily Ocracoke natives, chose not to go, but altogether there were 17 people including Coach Adam Burleson and family with them. Gaffer’s Ashley Harrell mixes up coleslaw for the Thursday’s delivery of Meals on Wheels. “I tried to keep morale up,” said Ashley. “We had a little bit of rain but otherwise nice weather.” The crowd had a great time at the lake kayaking, paddleboarding, and eating! A highlight was that all of the children learned to jump off of the very high dock into the lake. 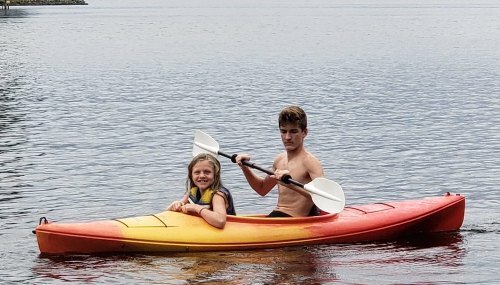 Red and Ashley Harrell’s children Malli and Jayden kayak during their evacuation on Lake Gaston. Some of the guys went jugging; catching fish with a line and baited hook and weight attached to a milk jug as a float. They had a great time chasing the milk jugs around the lake and everyone enjoyed the catfish they caught and cooked for dinner that night. Ashley enjoyed cooking for her staff; she said it was a chance to do something nice for them. Coach Adam Burleson shows off the catfish he caught by jugging on Lake Gaston. Leaving the island was quite an adventure, though. They prepared by boarding up their restaurant (a first), took their sign down, and packed up all the leftover food from the restaurant to feed their crowd. 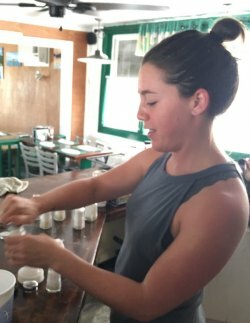 Ashley said that they were so busy preparing the restaurant to leave that other than important papers like birth certificates and passports, she didn’t think to take anything else. She commented that most of her photos are in digital format so if anything had been lost it would be easy to replace. They caught the Cedar Island ferry on Tuesday only to have the boat break down and return them to Ocracoke. From there they headed north to the Hatteras ferry where there was no wait. Fortunately when they returned to the island, there was only minor damage to the restaurant building and at home, only leaves everywhere. Gaffer’s employee Gus Sanchez enjoyed the break but it happy to be back home on Ocracoke. For Gaffer’s employee Gus Sanchez, evacuating was a new experience and a little stressful. He has only lived on the island for about a year and his fiancee, Jessica, had just arrived here from California less than a month ago. Gus said that when they left, they didn’t know if they would come back to a home or not. He just took his children and their clothes. The children were anxious at first but as they got the news that the storm had turned, they were all able to relax and have a good time. 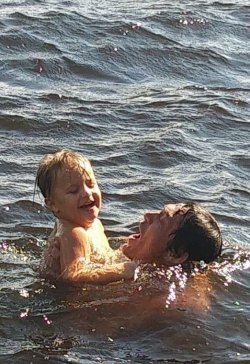 Gus Sanchez and his son Bryson enjoy Lake Gaston during the evacuation. At Jason’s Restaurant everyone was busy getting ready to open on Friday. A truck was there making a food delivery and though staff members were busy, they graciously took time to talk about their experiences. Amandolin Webb and boyfriend Beach O’Neal went to visit friends in Maryland, near Washington, DC. She said they don’t normally leave for hurricanes but this one looked bad with the potential for great devastation. She also said that when Beach’s dad Rex (a lifelong Ocracoke resident) and his wife, Miggy, decided to leave, they knew it was time to go! They considered going to her mother’s house in Charlotte, NC but are glad they didn’t since that area had quite a bit of flooding. She took her computer and important documents. “Not knowing what will happen is terrifying," she said. Amandolin Webb fills salt shakers at Jason’s Restaurant in preparation for opening on Friday, Sept. 21. Jason Wells and his son, Griffin, a 4th grader at Ocracoke School, along with friend Eli Schweninger, went to Greensboro, NC to Eli’s Uncle John’s house. Jason’s wife, Brooke, stayed. Brooke was going to leave, too, but decided to stay on the island with her father and the family’s pets. Jason and Griffin also made a trip to Boonsboro, MD to visit friends who are expecting twins. Griffin got to go to a horseback riding camp and to the trampoline park. Jason said that although Griffin was concerned about his mom, he had a good time on their “evacucation.” Jason says that they go somewhere different for each evacuation so that Griffin can have different experiences and see different parts of the state. Jason said “Being somewhere and having no responsibilities” was great and once the storm dropped down, he could relax and enjoy the trip. Also, he relished the chance to be away as other than going to the grocery store, he hadn’t been off the island since May. 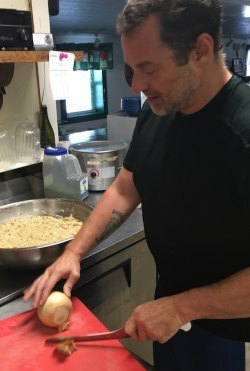 Jason Wells prepares fishcakes for the reopening of his restaurant. 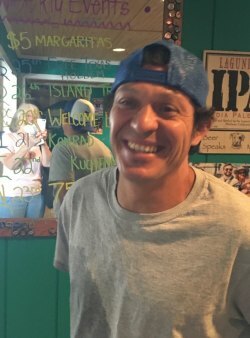 Jimmy Bowen, co-owner of Jason’s Restaurant and an Ocracoke native, evacuated for the first time ever. He said that his wife, Lynn King, pressured him to leave but because the storm was headed here and was a Category 4, he didn’t need much convincing. “I’ll stay for a Category 3,” said Jimmy, “but not a Category 4.” The Bowens took quite a bit with them: three cats, some artwork, important documents, some tools, and their wedding album. Fortunately for Jason and Jimmy, the restaurant only had minor damage that could be easily managed. 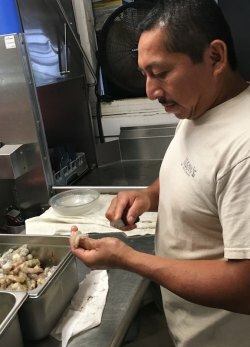 Jason’s employee Enerid “Coto” Lopez who has lived on the island about eight years, was busy preparing shrimp but took a few minutes to chat. He was worried about the storm so he, his wife, Yuriko, and son, Jose Antonio, left the island to visit friends in Crosby, TN. Coto Lopez processes shrimp for Jason’s Restaurant. Island resident and Flying Melon owner Paula Schramel also evacuated but her husband, Michael, and son, Nat, stayed on the island. They evaluate each storm individually when deciding to leave or stay. Michael was undecided but ultimately chose to stay with Nat and look after the restaurant. They were concerned that the storm could mimic Hurricane Floyd (which caused widespread flooding in eastern NC) and prevent them from returning. Paula then headed to Richmond, VA where daughter Maddy and her husband, Cliff, and (most importantly) granddaughter Eliza live. In addition to important papers she took with her a table that displays treasures she has collected and a favorite basket. She left her cats at home since her husband was staying. Restaurant, home, and cats all made it through the storm with no problems. 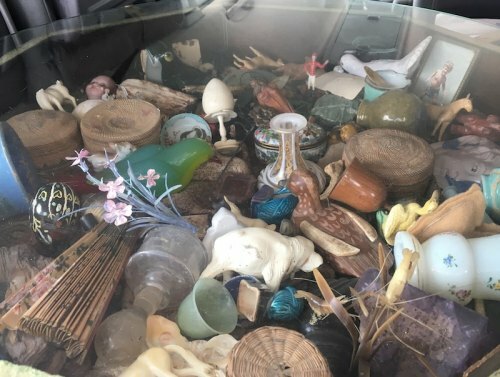 Among the items Paula Schramel took when she evacuated was this table filled with treasures she has collected over the years. Ocracoke Island Realty and Jason’s employee Jen Mongan and her girls, Emilia and Juliette Jordan, and dog Ripken left the island for Harford County, MD (near Baltimore) to stay with her parents. The normally nine-hour trip took a grueling 14 ½ hours due to the traffic from other evacuees. At the NC/VA border rest stop, Jen said that people were handing out free bottles of water, there were dozens of dogs, and people were leading prayers for those further south. Jen Mongan is relieved to be back home after making a long trip to Maryland. Although Jen felt like the projections were unclear as to whether the storm would be a Category 3 or 4, and was inclined to stay, she said, “As a mom, with the girls you should do what is in their best interest.” They took important papers and enough clothes to last an indeterminate amount of time. The girls took their backpacks and school books so that they could read, do projects, and work on homework. Jen left everything else at home. “Everything else is just stuff,” she said. “Stuff can be replaced.” They returned home to find everything okay, even the chickens and cats that they left behind. At Pam’s Pelican B&B, owner Pam Degen and friend Traci Ball were taking a break and relaxing on the porch and friend Stevie Hedgecock was repairing damage to Pam’s fish pond. Pam and Traci stayed at the B&B and Pam said that during the height of the storm her house “was really rocking!” She said that it was frightening in the middle of the night with the wind, rain, and with it being pitch dark. Pam Degen and Traci Ball relax on the porch of Pam’s Pelican B&B. Like many others who chose not to leave Pam cited the expense of leaving and said also that she wanted to be on the island to take care of her home and fix any problems before visitors were allowed back. Traci commented that sometimes “It’s easier to stay than to get back to the island." “Everything I have is here,” said Pam. They prepared by stocking up on canned food and water, bringing in all of the potted plants and outdoor decorations, and by laying the porch furniture down. During the evacuation they enjoyed the hamburger lunch that Tommy Hutcherson served on the porch of the Variety Store, and passed the time by having friends in to share meals. Fortunately the B&B only suffered some minor damage with trees down and a small leak. Stevie Hedgecock takes a break from working on the fish pond at Pam’s B&B. Stevie also cited the expense of leaving. Fuel for his boat generator (to operate the bilge pumps and dehumidifier) and line to tie up the boat, plus the expense of traveling added up to more than $1,000. 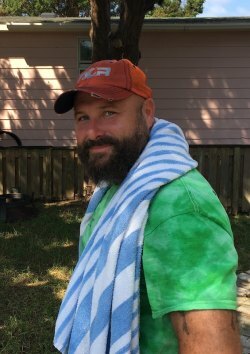 While he was off island, he raised money on Facebook to help Ocracoke residents but plans to donate that to the people on Cedar Island as the need there is greater. The Perez family consists of brothers Mel and Junior, sisters Lulu and Kathy, and all their spouses and children. The entire family minus Lulu evacuated, most of them to Kernersville, NC, to stay with friends. Mel, who has lived on the island for 22 years, said that his family always leaves during evacuations. They took their important documents, photos, clothes, and the dog. His wife, Vanessa, said that she was worried for the children and felt much more comfortable leaving. There were 14 people at their friends' house and they had a good time just spending time together, cooking (and eating), watching movies and four-wheeling. Since he has returned, Mel, who is a builder by trade, has been busy making minor repairs on some of the island houses. Gael Hawkins stayed because when her husband was alive, they always stayed. He recently passed away and she had just picked up his ashes on the Monday before Florence, so she wanted to honor the tradition they had by staying here. Their house is on high ground and she has a generator. Also, her cat, Saffire, was too sick to travel. Although he made it through the storm, Saffire passed away on Friday, Sept. 14. Luckily she had two friends and a dog staying with her, too. She also mentioned what many others have said, that once the storm is over, if you evacuate, it can be hard to get back home, and if there is damage to your property, it can be difficult to repair from far away. 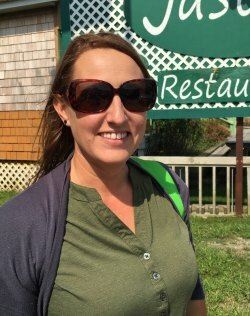 Gael said, “Bottom line is that I feel safe here and I have a great deal of faith in our Ocracoke community.” I don’t think anyone could have expressed this sentiment more eloquently. Everyone is happy to be home and relieved that the island didn’t experience widespread destruction or flooding. One thing is a given... there will be another storm and everyone will need to decide all over again; should I stay or should I go? Editor's note: County commissioner Tom Pahl urged residents to take this storm seriously and leave. He did not answer the Current's inquiries on why he chose to remain on the island.